Over the summer, we decided to join Clutch. Clutch is a ratings and review site that conducts market research on leading technology companies all around the world. Recently, Clutch announced the leading development companies in the Pacific Northwest. 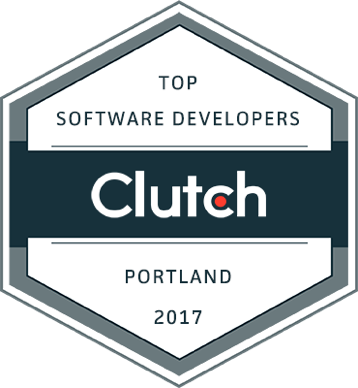 We are proud to announce that STATEMENT, now TechSparq, has the top software developers in Portland. It is an honor to receive this recognition along with such great talent in the Portland area. We know that selecting a company to develop custom software applications can be challenging and one must consider multiple criteria when selecting a team of developers. Clutch provides users with unbiased and verified reviews from past and current clients. These reviews allow potential buyers to get the most accurate information and help them decide which company to hire for their next project. Using a unique rating methodology, Clutch displays the leading technology companies using a Leader’s Matrix. The matrix is based on a company’s experience, service focus and ability to deliver. During a short period of time, TechSparq has received amazing feedback from our clients. One of our clients commended our project management saying that TechSparq is “very reliable and good at communicating.” From a technology standpoint, another client mentioned that we “understand how to build a high-capacity, high-performing technology organization.” These are just some excerpts from the incredible reviews that we have received from our clients. You can check them out on our Clutch profile. We are thankful to our clients who took their own time to review us on Clutch. This achievement would not be possible without their support. As we continue to grow, we strive to provide the best possible experience and results for our clients. At TechSparq, your custom software development partner, we specialize in working with Fortune 500 apparel retailers to maximize their revenues and build customer loyalty through a highly secure e-commerce websites that are protected against damaging attacks and won’t fail under peak loads. We are an integrated team of product designers and software developers using the latest proven frameworks and tools to deliver amazing new software products. We partner with forward-thinking businesses to create web-based applications and services, mobile apps, and business applications. Established in 2007, we are proud to call metro Atlanta home with Portland being our second home. We believe in taking a Lean Startup approach that's grounded in systemic thinking and strategic planning to solve complex problems for our customers.